Little warning first to users who still hold any type of warranty for their Inspirons. Upgrading HDD (Hard Drive), RAM (memory) and installing Video Card would not void your warranty, PSU (Power Supply Unit) could be questionable. Dell generally do not recommend changing CPU (processors) [as soon as you think about changing motherboard, your PC is no longer Dell, unless if it Dell motherboard from another model, but then it is Frankenstein, in this case you can look for help at Tom's harware forum, but not here], however I would present the list of Dell tested processors, and there would be another 2 processors not tested by Dell. Also, you can change the case to make your Inspiron look nicer, or to improve cooling, I would say - it would void warranty as well. Lastly, at the end, I would talk about overclocking, this would not just void any warranties, it would place you at my mercy, since I am the only one left here who done this and still willing to help others, just remember, as soon as you decide to go this path, you might endanger you PC - it could even catch fire and burn your place, so basically you are doing it on your own risk. I am considering, if you overclock Inspiron 570 you are agree with possibilities listed above and would not hold the grudge (or hold responsible) against me or any ohter members of this forum if you become homeless due to the fire caused by overclocking, LOL. I will start from less invasive and easier parts to more difficult and dangerous. Part 2. Video Card upgrade. Part 5. CPU cooling and general cooling in the original case. Part 6. CPU cooling and general cooling in the larger case. If I miss something I would come back and fix it, I would try to keep everything in one thread. When I would consider the Guide completed, I would say so. First things first - information. All Inspiron 570 manuals, next Driver download page easy and Driver download page not so easy. Prior asking questions, I would assume that you read corresponding manuals, so I don't have to explain you, for an example, how to open your case, well I hope you understand what I mean. According to the official Dell manuals, Inspiron 570 is limited to 8 GB of maximum 1333 MHz memory, however it was found that 16 GB of 1333 MHZ is recognized, faster RAM would slowed down to 1333 MHz. So far no one complained that theirs RAM (manufacturers) were not recognized by Dell. Generally it is recommended to use Crucial, however I used Corsair and did not noticed any problems. Also, try to avoid tall heat spreaders, especially if planning to use tower push-pull fan configuration - push fan may block access to the nearest to CPU cooler RAM slots. Unfortunately this is the only picture where you can see the situation. This is the Diagram with the same color code RAM. So you know, our Inspiron has only 300 watt PSU, so without changing PSU the strongest Video Card upgrade would be Sapphire (recommended) 7750, or cheaper and a bit less powerful version is 6670, for anything above this you would have to upgrade your PSU. Some people asked if the Video Card and RAM slots would "intercept", the answer is no. 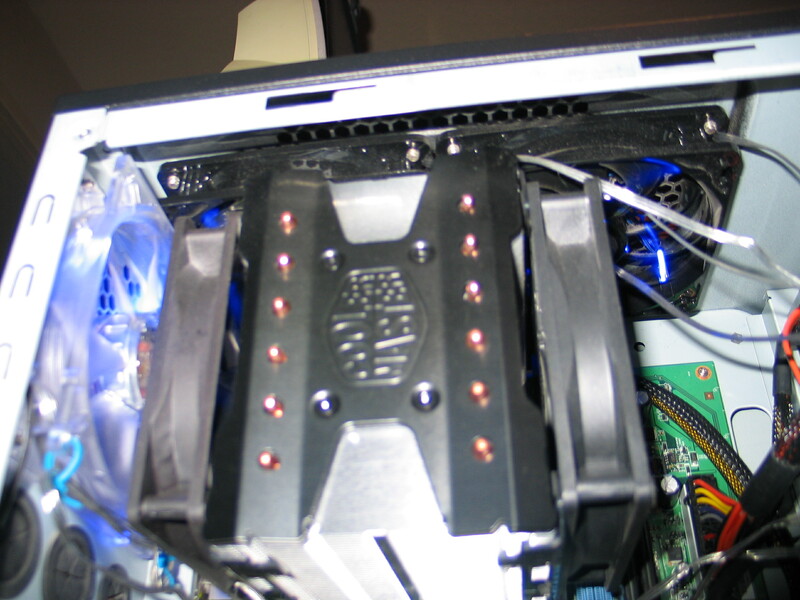 However, in order to change or add RAM, Video Card has to be removed to allow RAM holder clips to open, this is approximate picture below, the maximum length of the card is about 12 inches or 30 cm, in this case Video Card would go under HDD so you would have to measure upper clearance . Watch out for 2 SATA slots next to Video Card - they could be covered by Vcard heatsink, if this is happening you have to use sata angle cables. I realized that I did not cover much of Video Cards here. So a little more. As you notice I placed MSI 550 TI OC Cyclone for its exceptional cooling ability, this card is very tall, but short, measurements are (L)"x(H)"x(W)", 8.27" x 5.51" x 1.38". I will add more cards here as users will report. XFX Double D FX-787A-CDFC Radeon HD 7870 GHz Edition 2GB 256-bit GDDR5 PCI Express 3.0 x16 HDCP Ready CrossFireX Support Video Card 9.5" x 4.4" x 1.5". This is general guide for PSU recommended by MSI, I would add at least 50 watt to your final decision, however the more the better, some say 100 watt is very good idea, would not argue here. Any standard PSU will fit inside (there could be small bending of some metallic parts of the case required, but nothing major). 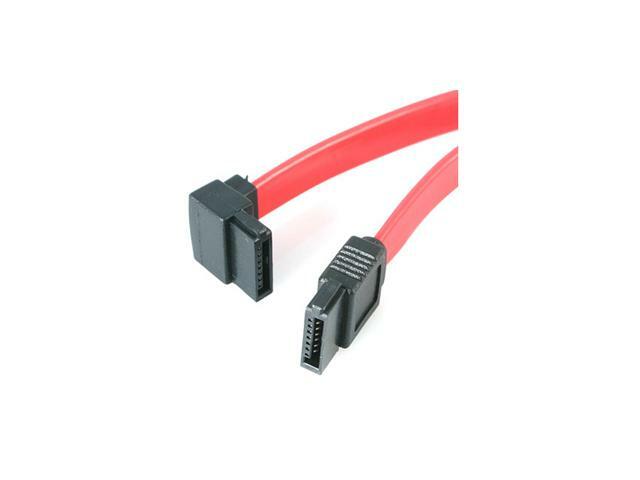 Just make sure that new PSU has 24 pin or 20+4 pin main MOBO (motherboard) power connector plus 4 pin ancillary power connector, 4 SATA power cables, and at least one 6 pin Video Card PSU connector. It could be modular or not. Modular are much more expensive, with regular you would have to improvise hiding keeping cables out of the way. Here are a few pictures of regular PSU, so you see that cable management can be a headache. To my best knowledge the recommended PSU manufactures are XFX, OCZ, Seasonic, Enermax and Corsair, I don't see so many complains about Thermaltake and Antec. 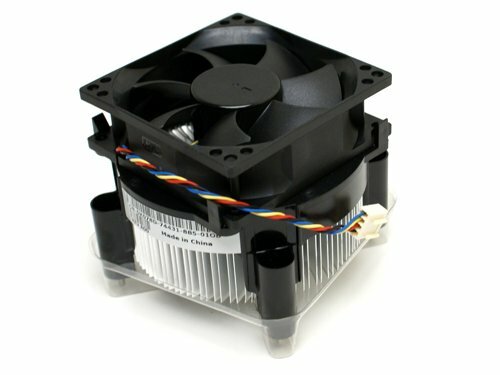 Store brands and surprisingly cheap PSU should be avoided if you want stability and assurance that nothing will burn or PSU will last for long time with the same specs over the time. Next I used Extreme PSU calculator to show that our standard PSU can support 7750 and Phenom 965 together, no PSU upgrade necessary, if no overclock. 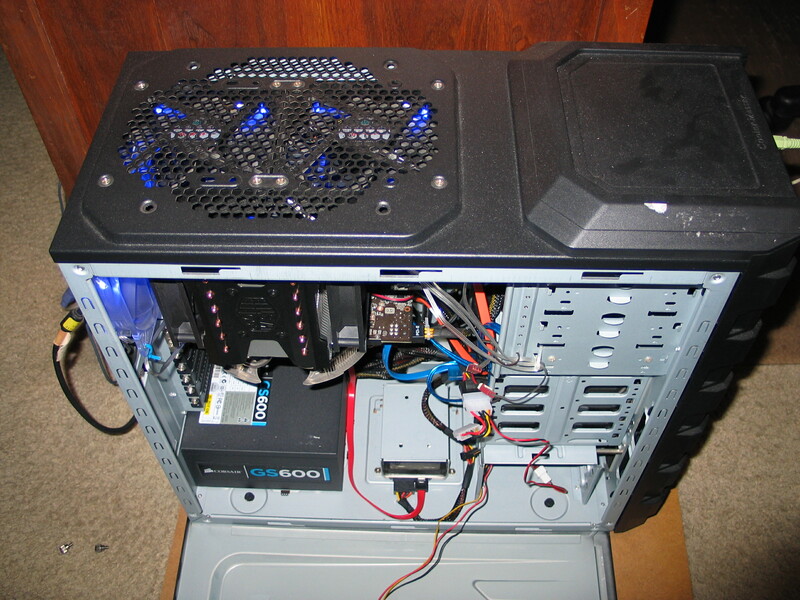 Inspiron 570 stock PSU is 300 watt and it is known that this number is somewhat underrated, so 302 watt is O.K. Now, PSU was in my Inspiron 570 model was HIPRO HP-P3017F3, below are the specs for anyone to chew. +5V = 22A, +12V = 18A, +3.3V = 17A, +5V aux = 2A, -12V = 0.8A; Special comment "+5V and +3.3V SHALL NOT EXCEED 160 W". If you need replacement, you can get it from here new for $38. Not exactly the same, but very similar. This is the list of Dell tested CPUs or I can say validated for use in Inspiron 570, it was reported first by Dell-Chris, I just edited it since in original list all processors were named Phenoms. Also, I will attempt to figure out the wattage for each of them as it is very important for cooling upgrades. Additional information on AMD processors can be found here. 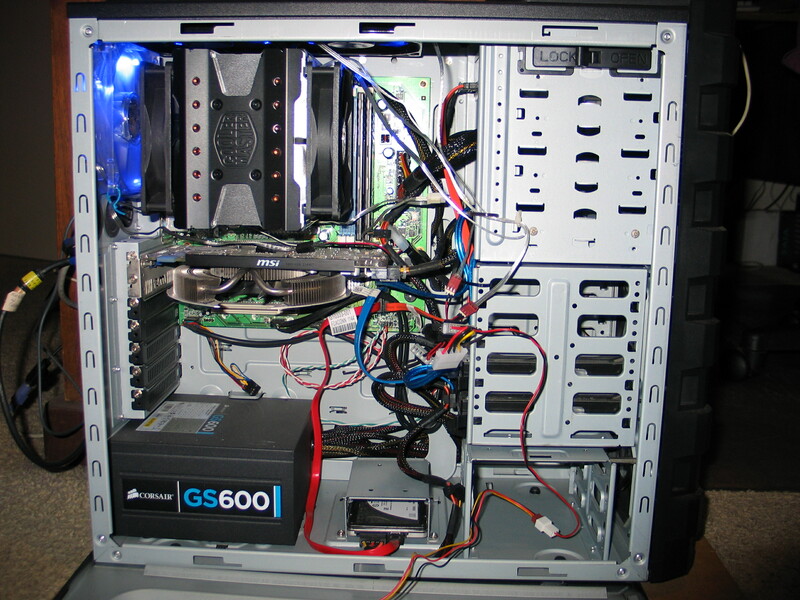 It is generally recommended to upgrade BIOS prior to installing new processors. THIS IS POSSIBLY ONLY APPLIES TO DELL VALIDATED LIST OF PROCESSORS! In addition to above list it was found by users like me that Phenom II x4 955 95 watt is working well. So far it is difficult to locate new processors from previously mentioned, the common place is eBay, HOWEVER, I just found today seller for plenty CPU models and not only CPU and not only AMD, worth checking - StarMicro. Prices are reasonable, comparing to the rest. The unreasonable ones, however categorized by Dell part number can be found here, they also have other basic Inspiron 570 parts, but prices, not good. Somewhere in between is this seller - Red Planet Trading, good place for images and information. UPDATE. It was found, thanks to GLENN-HO, that AMD Phenom II X4 B93 is accepted as well and recognized by BIOS A05. First I would cover cooling for above choices, prior to jumping to the ultimate processor for Inspiron 570 - Phenom II x4 965 BE, will discuss it later. So, basic cooling. You have a lot of choices here. It is very important to know that Dell motherboard (MOBO) model 04GJJT has Intel LGA775 screw type mounting socket, not AMD standard and not Intel clips, I think it was done by Dell to lower the overall costs. Circled in RED are CPU cooler mounting screws. Now the 2 Dell standard CPU coolers. 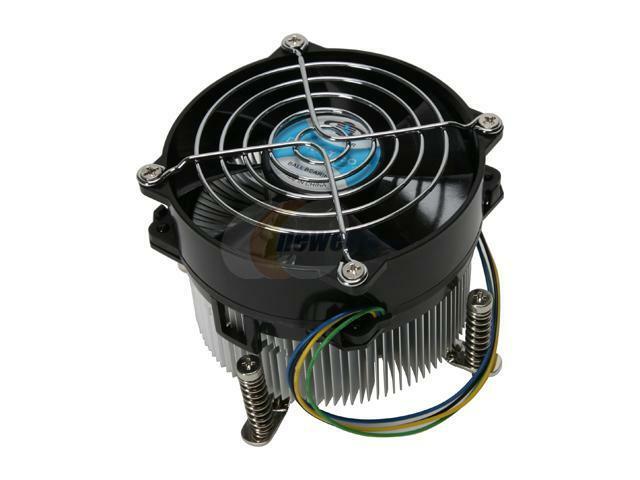 C957N Heatsink & Fan Assembly for 65W CPUs - $19.84 at Red Planet Trading. Now, I would show the newegg counter part, which reported good results in cooling and tested by OCMusicJunkie. Dynatron P985 $29.99 at Newegg. Phenom II x4 965 BE cooling. 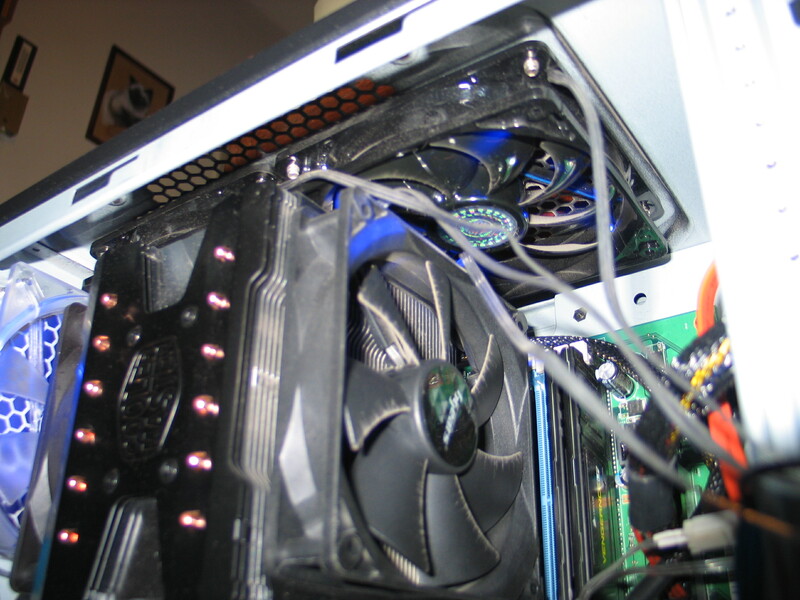 First I will discuss cooling in original, Inspiron 570 case. Phenom II x4 965 BE has TDP of 125 watt and as such, require more serious approach in cooling (previously I was discussing 95 watt TDP choices). Since I was the first to use Phenom II x4 965 BE in Inspiron 570, I have to decide myself the best choice for cooling, and at the end I think my choice was not that bad, however at this time I did not know the information available to me now, so the mounting was a terrible headache. Right now I would demonstrate a few ways to deal with any cooling upgrade - the easy one, IceEdge way and difficult one, however the second one lets user use many more CPU coolers, including heavy ones. First I want to defend my options against other ones. User can exchange push fan for any generic fan, also, there is attachment to use pull fan, which I actually did to maximize cooling. There are a lot of choices out there, however many of them are using proprietary configuration, so if fan goes kaput, user has to purchase exactly the same fan or, even worse, purchase another cooler unit (if the fan located inside of the cooler). Both of those coolers using push down pins to attach to motherboard. The way I did the job - I removed push down pins and substitute them for screws from the local plumbing store, this was long headache job, long story, I would not advise to follow my steps here. Instead, as I said previously, I found much easier way. Thanks to Dewrock, it was found that screws from LGA 1366 Bolt Through Kit fit perfectly Inspiron 570 motherboard. 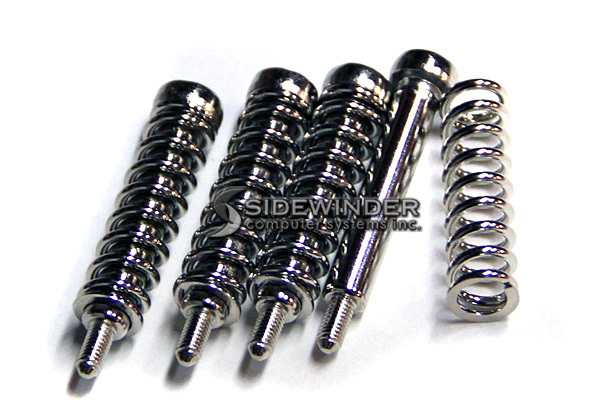 This means that any screws from kits shown below can attach with almost certainty original Dell Inpspiron 570 motherboard. So, what we need here are the screws, or mounting mechanism. Lets look at possibilities below, the last picture would be the best choice. LGA775 Bolt-Thru-Kit it is unclear where you can purchase this one, but you need only screws. Similar one, which can be picked up at Amazon is Thermalright LGA775 Bolt-Thru Kit - Rev 2 for $11.95 - it looks cumbersome, I would say not so appetizing. 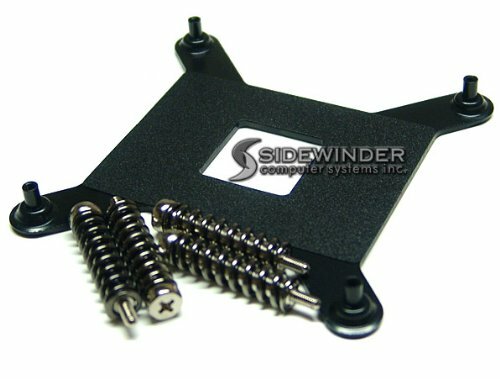 What I found better and even simpler is LGA775 Bolt-Thru-Kit with Screws & Springs by Sidewindercomputers for $4.99, this is really cheap. However, why we should spend those 5 dollars if we can spend much less!!! 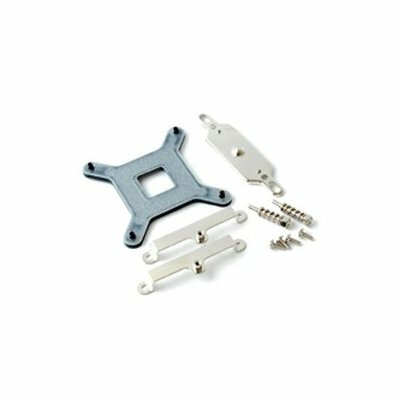 How about Four Bolts and Springs kit for LGA backplates - Version 1 and this is for only $1.99!!!!!!!!!!! Now we need a volunteer to waste 2 dollars and attach a cooler to Inspiron 570 using shown above screws. If it is working - you save 2 hours of work, you will prevent your motherboard from accidental scratch and similar disasters, only 1.99 USD. Thanks again to Dewrock above mentioned 4 screws should fit nicely. I would recommend to use them only for light weight coolers, or it would depend how flimsy cooler connection to motherboard is. 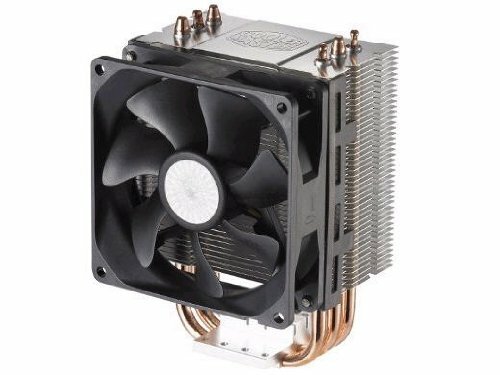 First I would mention the cooler capable of cooling down Phenom II x4 965 BE with ease - Ice Edge 400 XT $30.80 This is the best choice to cool down 125 watt processor in the original, small case. Larger cases can accommodate 120 mm CPU coolers. Important Update for anyone familiar with parts of my Guide already! I just found today, February 18, 2013 very important information regarding mounting instructions. 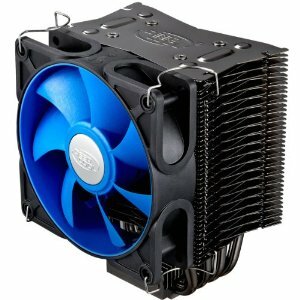 First, for anyone in doubt read this - DeepCool IceEdge 400XT Heatsink Review. Second, look at the pictures below, it is most likely that Ice Edge 400 XT could be installed on the Dell's back plate, using Ice Edge 400 XT provided parts - provided back plate looks very similar to Dell's back plate, if it is correct, then DeepCool IceEdge 400 XT is double winner - no special modifications are necessary to install it!!! UPDATE, VERY SERIOUS UPDATE. Third thanks going to Dewrock again for checking and, most important, reportting back his results - IceEdge 400XT is mounted directly to Inspiron 570 motherboard with IceEdge supplied screws. This is very important news, since now, Inspiron 570 CPU upgrade can be done by anyone with a bit patience, no special skills are required. Posting this on my Proudly Upgraded computer. I didn't even have to use the bolt-through kit. The processer works perfectly fine as well as the mobo. The fan connected [IceEdge} straight to the motherboard without any hastle. The only pain was clipping the fan to the cooler and the mess with the new PSU wires. after downloading check the file, it doesn't have an extension - ICEEDGE, you have to rename it to ICEEDGE.pdf to open it . 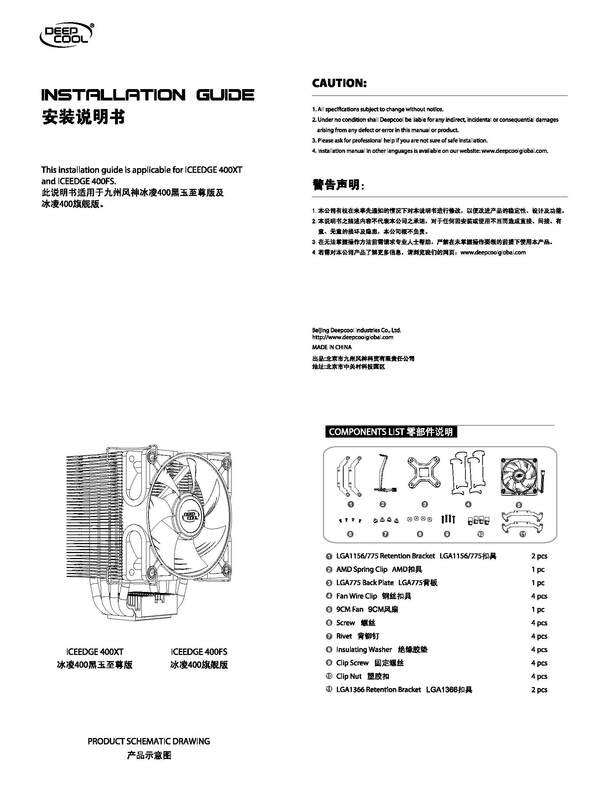 Please read all specs on the IceEdge information page - it appears to have PWM controlled fan, which is bad because you don't have software control of your fans so most likely you will have to change fan to constant RPM one, not a big deal (you can actually place it as pull fan and attach directly to power supply, so it will run at maximum RPM). Page 2 Just remember, we need LGA775 socket installation. And now is the cooler. You can use rubbing alcohol (cheap, but not perfect way) to prepare the surface of processor and Ice Edge prior to applying thermal compound, but if you want quality you have to buy ArctiClean 60ml Kit $6.62, also you have to buy Arctic Silver 5 Polysynthetic Silver Thermal Compound Paste $8.35, or you can buy them together for cheaper price option 1 $12.99 and option 2 $12.22, both look the same to me. And here you can check the Arctic Silver application methods. Ice Edge 400 XT supplies thermal compound in the package, however I don't know the quality of it. Next is discussion applicable only to Inspiron 570 overclockers, if you are not planning to overclock, stop right here! Now, I would discuss more difficult way - removal of Inspiron 570 back plate. I would jump ahead and say that overclocking will make your CPU real HOT and would require massive (in terms of weight) CPU cooler to keep temperatures down. Also, if you are planning to move your motherboard to a larger case (very possible and not so difficult) for the reason of insanity, I mean for the reason of overclocking, it would be better to remove back plate anyway due to the size and weight 120 mm coolers, I would not trust original back plate with up to 1,000 gm coolers (mine was almost 900 gm without pull fan installed later). Inspiron 570 motherboard backplate removal instructions. 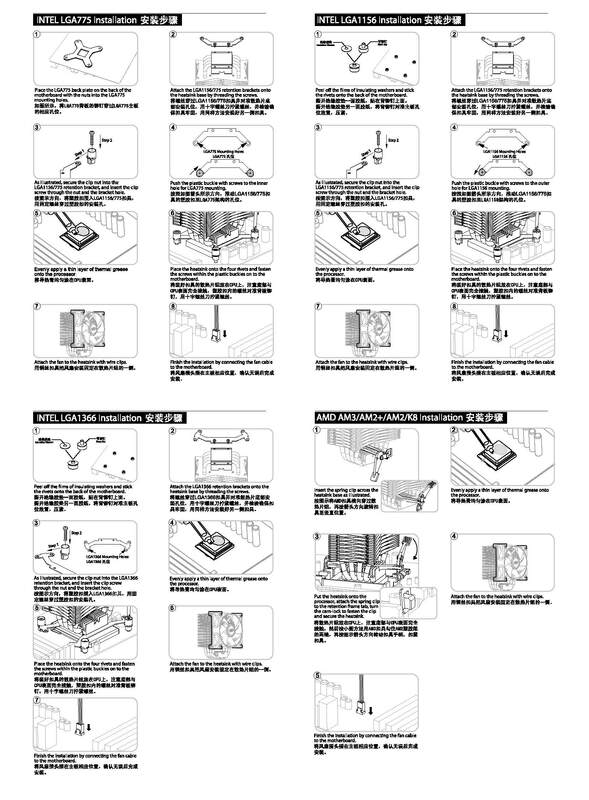 Those instruction are applicable to any similar looking Dell backplate, different models have different shape of back plate, but the idea is the same. Here is backplate. I used as you can see 4 peaces of plastic folded in half, approximate size (width) of already folded plastic is about 1-1.5 centimeters wide and 4-5 centimeters long. First you have to use plastic card (library card, credit card or similar) to lift backplate up a bit to insert those plastic assistants. Backplate is glued to motherboard! 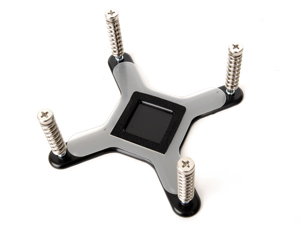 As soon as you inserted those FOLDED plastics, you can stick regular, flat screwdriver into the plastic folds and now you can use more force to lift backplate off motherboard, there is no rush here, you might need about 1 hour of monkey job. Lift a bit on 1 side, advance plastic closer to center, move to another corner, and so on. MAKE SURE THAT NO METAL TOUCHES MOTHERBOARD!Upper left corner on my picture is the most difficult to insert plastic and lift backplate, be extra careful here - there are a lot of protruding parts in this location. The glue, sticky paper located on the outer sides of backplate square as you can see in next picture. As soon as backplate is out, you have to carefully remove this sticky paper, here you can use only you fingers and nails - no metal here as you can easily scratch motherboard, improvise. 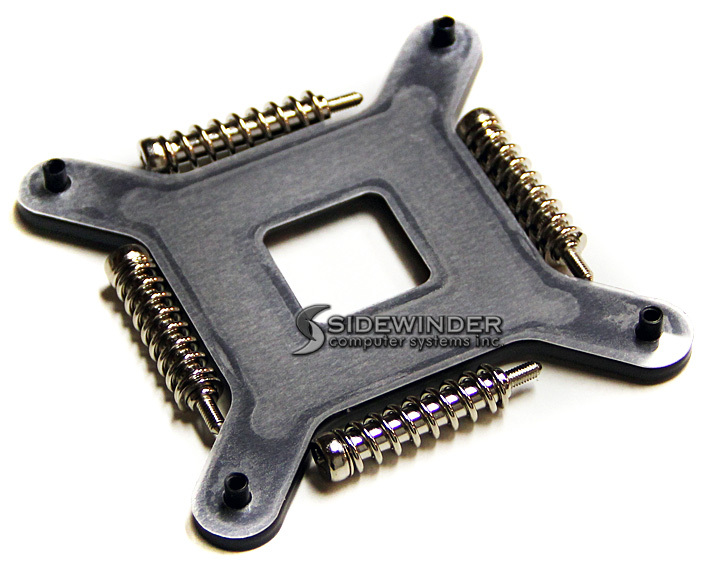 After back plate is removed, you can mount basically any LGA775 cooler of your choice, which has supplied back plate, I have doubts that Intel push down clips will fit into those holes. Next I will show my Inspiron 570 internal pictures in original case. Now about cooling in the original case. Some suggestions may apply for larger case as well. Important things to remember - maximum operating temperature for Phenom II x4 965 BE is 62C per AMD, so cooling is very important, unless you live in Alaska, LOL. Regarding fan issues in Inspiron 570 and the rest Inspirons (I found that the most of them have the same issues). Inspiron considered cheap model and as such doesn't have software fan control, meaning that BIOS and motherboard are controlling fan speeds, no matter what program I tried, I could not increase fan speeds, even when CPU was overheating. This is part where I am guessing: original CPUs are very low wattage and low heat producers, so BIOS and MOBO adjusted to for those parameters, when we place 965 in, it requires more power and produces more heat, however motherboard doesn't know this and cotinue to operate as if it is still low heat producing CPU (for an example Athlon II x2 250, was running max temperature around 30-35C). So, it is not guessing any more. In order to overcome those obstacles there are 3 ways to control speed of fans, all of them are hardware control, I will discuss all but strongly recommend only one. First of all let me say about sizes of fans. 92 MM for CPU tower cooler like IceEdge and for exhaust fan. We are talking about 3 fans in total (2 CPU push/pull and 1 exhaust). There is the way to place extra two 70 mm or 80 mm fans, but this is in case if existing cooling system is not enough, because it is a headache, I am done it - I know, will discuss in the other post. 1. Fan panel controllers. The best choice, but requires a lot of work and it will occupy second DVD slot. Here a 2 examples, I was not testing them, since I went easier and cheaper way. However, if you know the subject it is advised to go this way to lower down the noise level. 2. Another way is to use fans with fan controller attached to them, which is a good idea if you can place those controllers outside the case, usually they have very short cables. 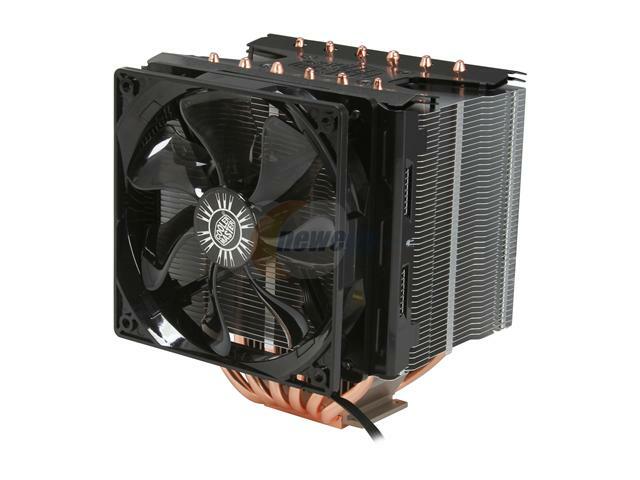 This is cheap way, but there are not so many choices, here is Antec Tri Cool 92 mm. 3. This is my way, simple, cheap, but can be noisy - you basically place fan to run at maximum speed at all times, you can do this by bypassing MOBO speed control (PWM) by using one of two choices: 3/4 pin fans where 3 pin goes to motherboard and 4 pin Molex to the power supply, so fan receives full power and runs at 100%, and the second choice is only for CPU fan which attaches to the motherboard using 4 pin (looks like 3 pin) connector, in this case you are using 3 pin fan - missing wire is speed control - you fan is running at 100%. Here are a few recommendations, I tried to choose not so noisy ones (for me personally I used fans from my old parts, from old Dells). First, two 3 pin fans which could be great substitute to IceEdge fan if it runs to slow and CPU gets hot (ICEEDGE fans seems to have 4 pin connector, which will be mobo controlled). 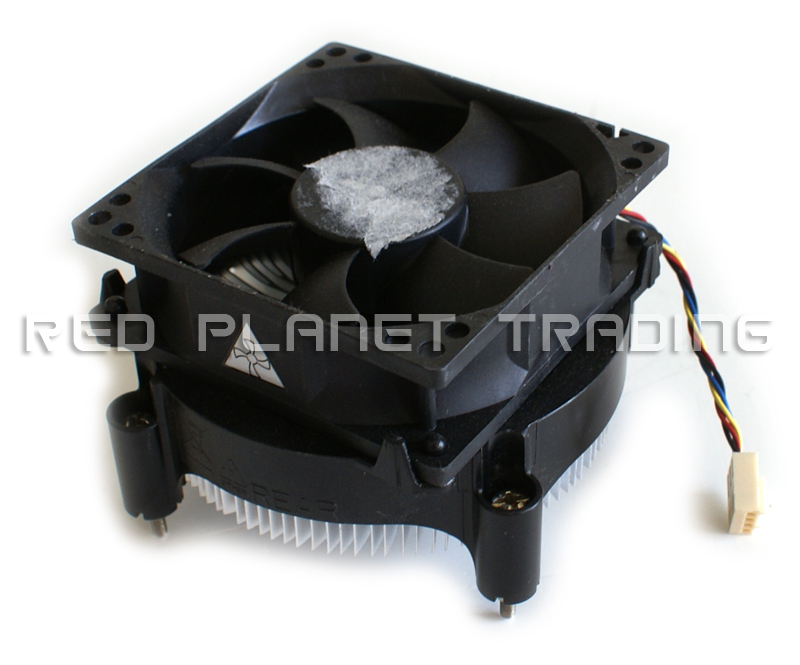 ARCTIC F9 Case Fan and Rexus TopMotor DF129225BM. If I had to redo my work again and did not have old parts I would use one of them for my CPU push position. Next is the exhaust fan, in this case you MUST use 3/4 pin (2 pins) fan, because 3 pin attached to MOBO and MOBO thinks that it is controlled, but the 4 pin Molex get attached to power supply and thus fan runs at 100% bypassing MOBO speed control. I could not find anything better than this one (in my opinion). CityNet 92mm Case Fan can be found at Frys and Amazon, for the same price. There are more choices like this, but CityNet seems to have better CFM to noise ratio. It also can be used as CPU pull fan, I think I actually used one in my original case. Now this is how it was looks like in original Inspiron 570 case. 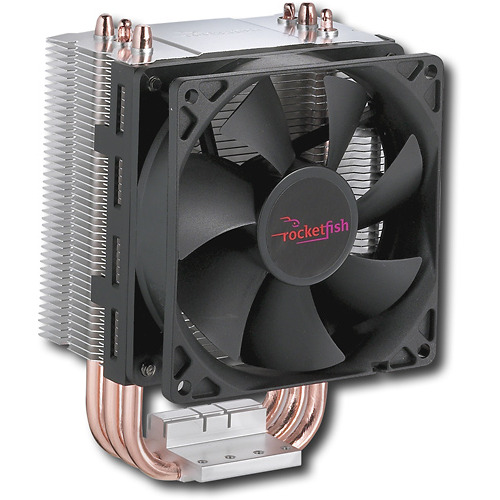 This is Rocketfish 92mm cooler re-branded by BestBuy from COOLER MASTER Hyper TX3, both are almost identical, but I used Rocketfish, because it was available around the corner. Cable management, I hate it. View from the back angle. I think I covered them all, 80 MM fans, if you decide to install them you would have to connect them directly to PSU. There are a few suggestions in this department - if you feel comfortable only - drill holes in case. First - lower part of front plastic panel for those intake fans to get extra air. Without those holes I felt some help as well, my temperatures were going down after testing much faster, compare to case without them. 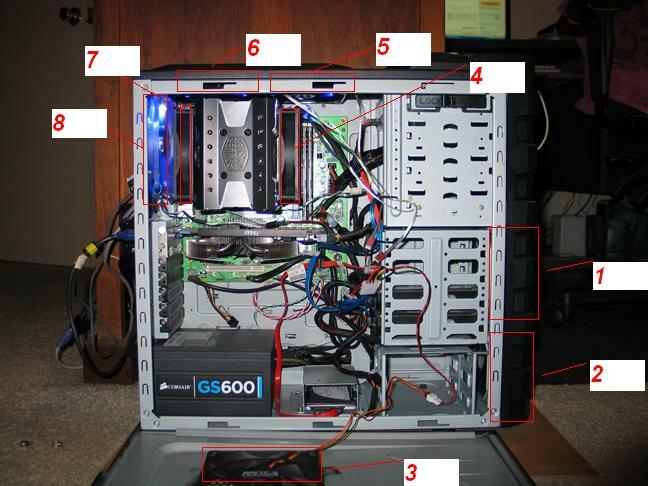 Second, drill the holes in the bottom panel right under hard drive location, it was done by on user, however he did not post any pictures, so I don't know. Third, make a holes on the side panel and install extra fan there, will help a lot, since Inspiron 570 is very air tight case. Forth, make holes in upper panel for extra exhaust fan, will help a lot. Fifth, one user reported placing water block inside, but again no pictures provided, unfortunately. This is about it, I think I will look into a few parts here for some fan model recommendations, but overall this reply looks complete to me. Next will be discussion about larger case. For now I will trow picture of my HAF Inspiron here and see what can be added later. So, Cooler Master HAF 912 happened to be my choice, there are many more capable cases, however it is important to remember the reason you will be looking for new case, if it is just fancy looking, anything would go, if it is for overclock, choose the one with more fans and holes for excellent airflow. Here are a few views of my remastered Inspiron 570. My CPU cooler choice happened to be Cooler Master Hyper 612, which is a bit overpriced, however it does the job, but if I would be given second chance I would go for Cooler Master 212+ EVO, which reported better results (did not know at time of purchase) at less $$. Next picture I will make larger - my fans explained, again there are many choices, I just showing a possibility. 2. (2 and 3 same). Cooler Master A12025-12CB-3BN-F1 (came with my case HAF 912), 1200 RPM, 44.03 CFM, 17 dBA or 19.8 dBA (this fan sold as OEM parts only so parameters are approximate). This fan was in position of number 1 fan, dropped down as less essential. 3. Cooler Master A12025-12CB-3BN-F1 (came with my case HAF 912), 1200 RPM, 44.03 CFM, 17 DBa or 19.8 dBA (this fan sold as OEM parts only so parameters are approximate). This fan use to be an exhaust one, too weak, so it was replaced. 4. and 7. Same. CPU Push (4) and Pull (7). BGears model b Blaster, 2000 RPM, 103 CFM, 35 dBA. My strongest and loudest fans. 5. and 6. Same. Upper exhaust. Cooler Master, 2000 RPM, 69CFM, 19 dBA. 8. Exhaust. 3 speed controller box, I cannot hear it at max RPM, so it run at max all the time. Antec, 1200 / 1600 / 2000 RPM, 39 / 56 / 79 CFM, 25 / 28 / 30 dBA. Exhaust fan (must have 3 pin I think or 4 pin) motherboard connector, so motherboard thinks that it has control, and extra connector for power (I have 4 pin Molex) so PSU pushes this fan to max. CPU push fan is PWM controlled, so when hot it suppose to run fast, well, I tested many times my setup and it never reached max RPM, not even close. 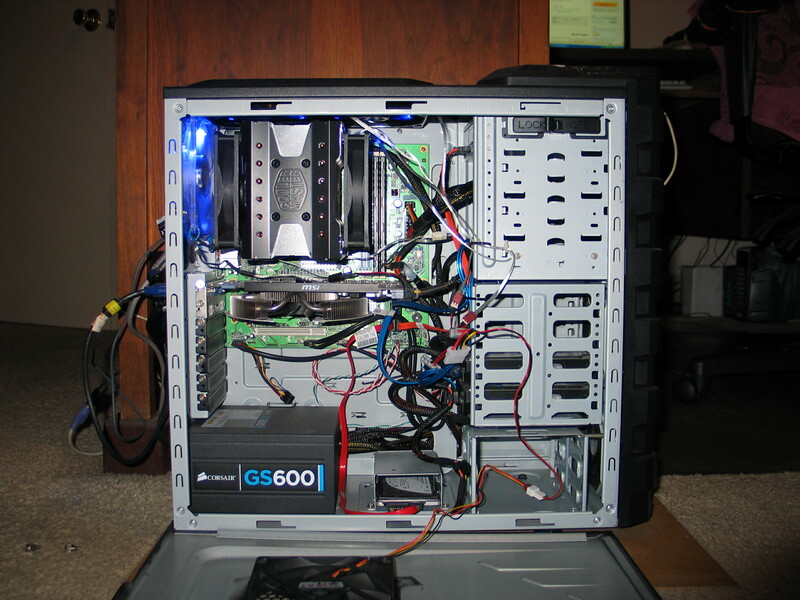 Remember, I was testing my new setup during last August (2012), it was HOT! So I have overheat at CPU. This is the reason for me to change my setup. I placed also CPU pull when I saw high temperature on motherboard, CPU pull solved this problem. So CPU fan has 4 pin connector (at motherboard), when 3 pin connected, there is no PWM control and CPU fan runs at max speed. I will just list the software I use, some of the links provided in different parts of this guide probably got old, so I will review and indicate the lates version as of today 02/17/2013. OCCT latest version OCCT PT 4.4.0.b03 - excellent monitoring and light testing program - a must have for all who stress theirs PCs. CPU-Z latest version 1.63 - if you don't have it, you have nothing to do here. Catalyst Control Center version used is 12.1 - latest is 13.1, which one to use, hm, can not say. AMD OverDrive latest version 4.2.6 - I used version 4.1.0.0575. Core Temp 0.99.8.0 / 1.0 RC4 - this is the latest version. Excellent little program, almost must have. Win7 clean iso, non Dell sourced - please choose identical to yours version. Double Driver 4.1.0 - One of the best free utilities to back up your drivers prior to reinstall Win7, make sure that you have Network driver, as I seen too many posts with users unable to reinstall this particular one. Prime95 - get it here or here. For overclockers, Prime95 has a feature called "Torture Test" that allows maximum stress testing on the CPU and RAM. There are several options allowing the stress test to focus on the memory, processor, or a balance of both. Usually Prime95 will detect an error within a matter of minutes if an overclock is not stable, however many people like to let the system "burn-in" overnight to ensure long-term stability. 1. More accurate than Prime95 Small FFTs/Blend (under x64 OS). 2. Takes less time to tell if your CPU/RAM is unstable than Prime95 (usually something like 8 minutes Linpack vs 40 hours under Prime95). 3. Use the same stress-testing engine that Intel uses to test their products before they are packed and put on shelves for sale. Speccy - good information program. And the last one, the Ultimate Video Card stressing tool - Video Card Stability Test version 1.0.0.3 build 80416, it is old, but works on Win7 64 bit and below, can not say anything about Win8. This small utility will stress your video card to extreme levels, I was surprised to see my temps going to 80-90C, while during any games or different stressing I never saw above 65C! Just run it, don't expect any logs generation, this little proggy just stressing your GPU to the extremes. Overclocking, this will include some guides for very beginners. In order to overclock Phenom II X4 965 BE (this applicable to any BE processors, BE stand for unlocked multipliers, about this a bit later) you would have to reinstall WIn7 OS, and you have to do this using generic Win7 Home Premium from Microsoft website, also you would have to say goodbye to any Dell supplemental programs - there is a "plug" somewhere in Dell software to prevent overclocking, I tried without reinstall and nothing worked. Unlocked multipliers explained in short. There are 2 ways to overclock, first, the most preferred one is through the BIOS, it is possible with proper motherboards and enhanced BIOS, second way is by overclocking software, without help of BIOS, this applicable to cheap motherboards with simple BIOS. Using first way, any processor can be easy overclocked in different PC. For the second way you have to have processors with unlocked multipliers, which is BE editions. I hope I clarified some issues here. A few words about cooling. Phenom II X4 965 BE is rated at 125 watt, which is quite hot already, overclocking will raise power consumption and therefore increase temperature. Per AMD website - Phenom II X4 965 maximum operating temperature is 62 Celsius, per overclock forum, to prevent damage to the chip, overclock should stop when temperature reaches 6... (tested by CPU stress utilities, not regular programs). You will have to reinstall Win7, and the most important part, you will have to use clean Win7 from Microsoft, not Dell edition, since Dell placed software restrictions to prevent overclocking. Now the tools of trade. If you using ATI video card. Get Catalyst Control Center v12.1 as the most stable version (reported to me by the first Dell Inspiron 570 overclocker). (that was summer 2012 advice, so Catalyst might got newer good editions). If you are using NVIDIA video card, or ATI and just want to use generic overclocking tools, get AMD OverDrive. For Monitoring I would advice using first, OCCT monitoring and testing software, latest beta OCCT PT 4.3.2.b02 is stand alone (not requires installation, just unzip and use). Third and last, Core Temp, I am using Core Temp 0.99.8.0 / 1.0 RC3 - this is excellent utility, you can monitor your status from task bar, also it has overheat protection - you can specify critical temperature and action to take, Core Temp will shut down your PC if you want, I tested this part and it is working great. Now you need Microsoft Win7 (not Dell Win7). Download the Windows 7 Home Premium 64-bit ISO from the link below. This is the authentic ISO from Microsoft's official host site. I have double and triple checked that everything explained here complies in full with Microsoft's user agreement. Please note that this is only true if you download the same version you had installed on your computer at the time of purchase; any attempt to upgrade versions will likely fail and will certainly violate the user agreement. Next you can create bootable USB to instal from USB, I prefer simple way - burn WIn7, from the link above, to DVD. Now the action. It is better to install new WIn7 to another HDD, so if something go wrong you still have original bootable OS. If you have only one HDD, save everything - you have to do clean install, do not attempt to save any settings as you might save Dell restrictions. From my experience, the only drivers you have to worry about (and install after clean install) are Ethernet and possibly (if you using NVIDIA, NVIDIA HD Audio is working just fine) Audio drivers. You can look for original drivers on Dell support site, or use driver backup software now, get your backup files and install the same software to new installation and restore Ethernet and Audion drivers using one of the following: Driver Magician Professional (not free, I used this one) and/or Double Driver 4.1.0 (free). Both those utilities reported to be the best form the rest. Insert the USB boot drive into your computer or Win7 DVD, then restart. Press F12 when prompted to enter the boot menu and select this drive instead of your internal drive/ or boot from the DVD. It will eventually load a screen asking to select a drive to install windows. Here you need to delete *all* partitions that sit on the physical disc you are reinstalling the OS. Now select that unallocated space for the install. It will do it's thing and install Windows 7, stopping when done to prompt you for the activation key. Use the key that is adhered to the top of the Dell tower. After it accepts your key, elect to not instasll system updates at this time. We want to finish the whole process before complicating things. You should now have a *CLEAN* OS with no bloated list of utilities and freeware that come preinstalled on virtually all new computers. Now you have Win7 installed. If you have ATI Video card next step is enough. BIOS. You have to do this prior to overclocking! Open BIOS, go to ADVANCED tab to CPU Feature to AMD Cool 'N' Quiet - disable it, it will make CPU to run at constant speed. I tried to avoid this and my game play suffered, also it is recommended by serious overclockers as well. Save and boot into windows. To check if AMD Cool 'N' Quiet is disabled right click on Desktop-->Personalize-->click screen saver-->click Change Power Settings-->click Change plan settings (I have balanced, I removed sleep mode "NEVER", all things are running, only monitor allowed to sleep)-->click Change Advanced Power Settings. Now you enter advanced power tree. The most important thing related to overclock here is Processor Power Management TAB, you should have only System Cooling Policy setting Active, and nothing else under this TAB, if you have another parameter about % of power or something like this your BIOS is not set! But, you can set CPU running at full speed here as well if you have problems with BIOS AMD C&Q option - set minimum CPU to 100%, now your CPU will run at full speed controlled by WIN7 instead of BIOS. Run OCCT to make sure that your processor constantly running at 3400 MHz. First install Catalyst Control Center v12.1 with all offered features if using the custom install screen. Restart when prompted. Right click on your desktop, open the Catalyst application, and scroll down to "performance". Enable overdrive, then select "CPU Overdrive". It will force you to run the auto-tune feature the first time through- when you either reach a successful overclock point you are happy with, stop the auto-tune. Otherwise, you can wait and eventually have the system crash and reboot itself, This is not anything to freak out about; it's how the program determines the limit for manually setting the processor clock. When you restart (select normal boot, no offered repair menus during startup) the desktop will load and you'll receive a pop-up letting you know your overdrive settings are ready to review. If you are using NVIDIA Video card or just want more detailed expirience, install AMD OverDrive. Second, install all monitoring gadgets mentioned above. Now you are ready for action. Please don't play with voltages yet since Inspiron 570 MOBO is too weak and who knows what will happened, if you do please post it here, so everyone would know the results. If you choose Catalyst Control Center v12.1 go into the same place you ran the auto-tune, scroll down and select the "manual" overclock slider as active, and select a clock speed. Apply and go ahead setting your GPU core and memory clocks if you wish to overclock them as well. When everything is selected and applied, "X' the program and it will remain active in the tray next to the clock on the menu bar. Now overclock using AMD OverDrive. AMD OverDrive. First or second you have to go to PREFERENCES tab and enable/click Apply my last settings when system boots, this will enable software overclock on boot up1 Do not enable "Enable fan broken detection" it gives many false readings here and will interrupt your activities for noting. Next go to PERFORMANCE CONTROL on your left to Clock/Voltage. DO NOT PLAY WITH VOLTAGE - this could be dangerous and you can burn your motherboard, I did not! Under CLOCK make sure that "Select all cores" box is checked, next is CPU CORE 0 MULTIPLIER slider. Currently it suppose to be at 17 X, slide slow to your right. How it is calculated, you see HT ref. Clock (MHz) grayed out slider, it is set at 200, we can not change it unfortunately, so the speed of CPU is = ref. clock X multiplier, so now you have 200 X 17 = 3400 MHz. Magic slider. Each Inspiron 570 could react differently due to the poor craftsmanship of Dell motherboard, so you might reach mine settings of 20 X (4000 MHz) or you might go above, or not even reach this number, now everything in GOD's hands. The rule here is simple. You slide by 0.5 to 1 X each time, click apply, reboot PC, go to OCCT and run CPU Linpack for at least 30 minutes, if it is successful you can open AMD OverDrive and slide the slider by another 0.5-1 X, repeat reboot and OCCT test. As soon as BSOD (Blue Screen of Death you would know what is this when it appear) happens - turn off PC by power button, go to AMD OverDrive and slide slider back by at least 1 X and run OCCT test for at least 1 hour. If you pass, next you want to stress your PC even further. OCCT provides mild stress tests, which are close to real world applications. To ensure complete stability of your system you have to try something heavier. Prime95 and IntelBurn are very serious stress tests, if you pass them your PC is very stable, if you have BSOD on any of them - it is better to slide the SLIDER back a bit 0.5X and run the test again. During any stress test keep OCCT open in monitoring mode so you can see your temperatures. remember 62C for any of your cores. If during testing temperature goes over 62C for a few seconds it is tolerable, if T stays above 62C consistently - it is not good - your cooling need to be upgraded or CPU downclocked! And lastly, Install CoreTemp - excellent background temperature monitoring proggy, it will run in the task bar and you can see all your 4 cores temps and your current CPU clock speed, you can tweak this program to your likeliness. Also, it could be setup to do automatic shutdown if core temperatures exceed given T. This option located under Tools->Overheat protection settings-->you will figure it out. Take a closer look at this picture, pay attention to OCCT, in settings you can disable all voltages, since you can not change them (well you can change only 2 of them at your own risk) and you can rename other settings. Install Speccy - good information program, it will help you to identify motherboard temp GPU temp so you can rename them in OCCT for easier monitoring, your assembly in OCCT is your hard drives TMPINO in OCCT is 2 values one for CPU and the other for motherboard temperatures. Motherboard temperature is also important, you don't want this number to reach the sky, the highest temperature during heavy testing is your motherboard temperature, I don't know the limit, however try to lower it as much as possible and close to your CPU temperature. It is possible to increase VCore in AMD OVerDrive and increase the overclock speed, however this will shorten the life of your motherboard a lot, currently as you can see I have max VCore at 1.39 volts compare to 1.5 to 1.55 volts for all general recommendations, so I am sure that my motherboard will survive this abuse a bit longer. Conclusion, I hope it would be the end of my project not me. First of all I have to acknowledge that Overclocking was first made possible by OCMusicJunkie, who was the first to find the WAY! He left this community about 6 months ago, unfortunately. I just made the guide, and used different tools to do the job. Tomorrow morning I will try to explain.